Today I have a new product and new shop to show you! I'm very pleased to introduce cuticle fizzies by Cuticakes. Here's a little bit about Cuticakes from their Who We Are page: "cuticle softening fizzies with high quality organic oils and materials. All the products are sourced by us from reputable sources right here in the USA! We love small businesses here within the USA and never outsource, thus keeping our economy booming." Ok, on to the good stuff!! I received several flavors of Cuticakes, but by far one of my favorites (ok that's a lie, they're all my favorites) is the Chocolate Bunny, or as I like to refer it it as, the Exploding Chocolate Bunny. This fabulous little fizzie not only left my fingers feeling fine, but also left my whole room smelling like brownies! Cuticakes can also be found on Facebook where you can see more videos and reviews from others who love Cuticakes as much as I do! Well, shockingly enough, I'm still alive! After a long unplanned hiatus, it's time to get this blogging thing rolling again. 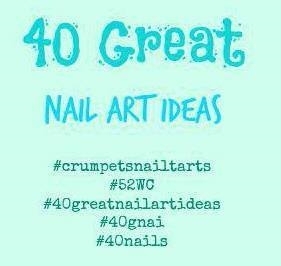 I've got so many polishes to show you!!!!! Let's just get started with a new-to-me indie brand called Mango Bunny which is owned and operated by a very lovely couple whom I've had the pleasure of visiting with and I love finding indie polishes that hail from my own Pacific Northwest! 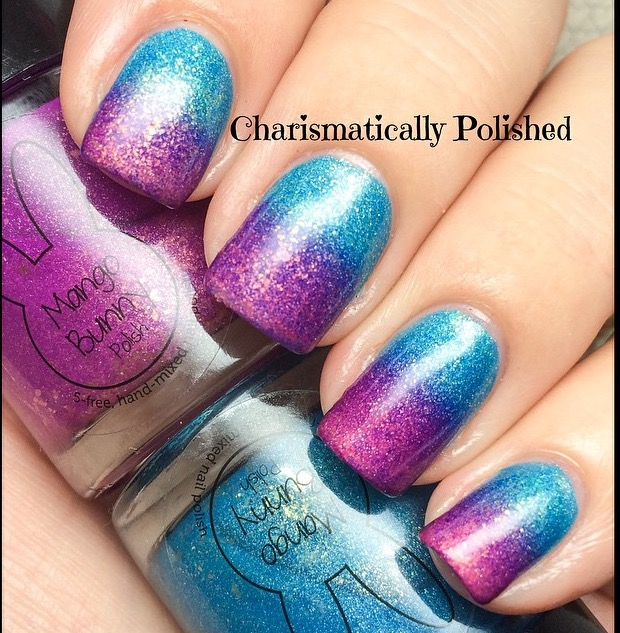 Their polishes, quite frankly, are stunning, and I have two to show you today. These polishes are Iris You Were Here (purple) and Hand L'Ocean (blue) which are from her Sunkissed Neon Collection from this summer. If you're looking to have a little bit of summer on your hand year round, these polishes, my friend, are definitely for you! Hand L'Ocean is a beautiful summer ocean blue with gold flakies, and Iris You Were Here is the perfect bright purple with the same gold flakies. The photos, my friends, don't do them justice. These photos were taken under open sunlight. In both the top and bottom photo, I used three regular coats of polish and a topcoat. Naturally, I had to do some art with them. 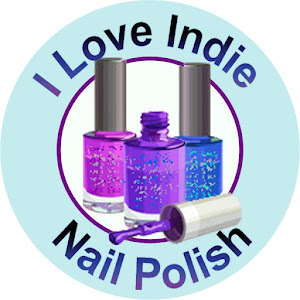 This one is stamped with Moon Nail Art Supply's Handy Nail Art in Fuchsia and Light Blue and a stamping plate which I now cannot find (sorry). The shiny glittery product you see around my nails is the awesomeness Simply Peel from Bliss Kiss, which frankly, I don't do any nail art without anymore. It's the most awesome latex barrier for nail art and cuticle care I've found. 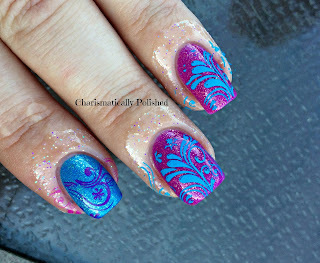 This one is a gradient of both polishes, which came out so much better than I imagined. I sponged these two together, and it took a few applications to get the look I was happy with, and topped it off with a quick dry top coat. This photo was taken with a lightbox. Both of these polishes applied so very well, and where opaque with three regular coats; the brush applied the polish perfectly and there's no fishing for the flakies, they float well and are plentiful in each application. 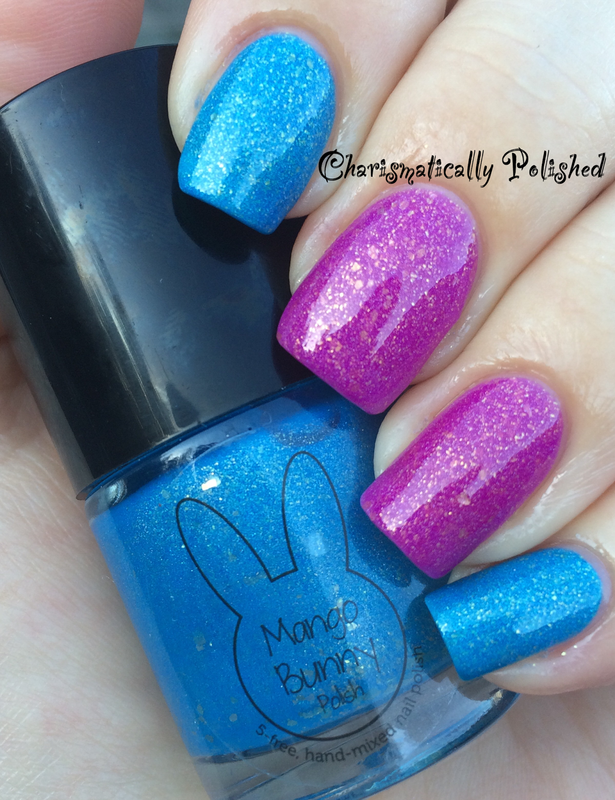 You can also find Mango Bunny on Facebook which has wonderful photos of some of the other polishes available, as well as some links to awesome bloggers and their thoughts.